I got turned on to Habitica through a recommendation on Reddit. The idea immediately interested me—it’s a game, but the way you score in the game is by building real-life habits that improve your life. If this method doesn’t work for you, Scott Allen just shared his view on How to Succeed Without Setting Goals. I’m a firm believer that the way to become the person you want to be is through the creation of positive habits. However, for me, this has always been a slow and difficult process. It’s difficult for me to keep track of all of the things that I want to add to my daily routine. I’ve tried different habit tracking apps in the past, but using the app itself has to become a habit, and often I find this to be more of a chore than the other habits I’m trying to ingrain. I end up focusing on one thing—and only one thing—for a long time. I get pretty good results on that one thing, but this leaves dozens of habits un-adopted. I’ve been using Habitica for more than a month now, and I’m seeing major improvement in the most important areas to me. Habitica is free for iPhone and Android, but my review focuses on the web app you can access from your computer. I prefer the web app; it has more bells and whistles, and it’s easier, from your browser, to see all of your habits and tasks. Some will, undoubtedly, prefer the mobile option, but since the bulk of my workday is spent in front of a computer, the web app is where it’s at for me. The great thing about Habitica is that although it is a tracking tool, it’s built to feel like a game. When you do the real-world things that matter to you, you get experience points, items, in-game currency, level-ups, and (perhaps most importantly) fanfare. It may seem silly but the musical cues that play every time I do something good for myself, really make a difference in the feel of the whole process. Dr. B.J. Fogg talks about this quite a bit. If you celebrate every time you do something right, you get a cumulative feeling of success and wellbeing. I can, at least anecdotally, confirm this. The items that you collect while you play are also a bit silly, but they function to increase the addictive nature of the game. So many of us get swept up in addictive games—games that make us feel we need to get that next thing—that don’t do anything to improve our lives. I’m more than halfway to collecting all of the in-game pets. Most of them are aesthetically disappointing, but the obsessive part of me needs to get them all. It’s a small thing, but it helps. If you have that personality type—that “I need a full set” type—this might help you stay focused on your goals, as it has for me. Finally, the game gives you the option to go on quests some of which are based on collecting certain items (see above for why this works) some of which are based on fighting bosses. When you’re in a boss battle, the tasks that you accomplish do damage to the boss. On the other hand, fail to accomplish a task and the boss does damage to you. You lose health points any time you miss a task you’ve set as required, but you lose more when you’re fighting a boss and if you lose enough health your avatar can die which results in a loss of a level. Quests can be taken on with teammates. My boyfriend and I play the game together (our house has never been cleaner). This is a great accountability tool. If my boyfriend misses some tasks, I take damage for it, so we’re not only working to improve ourselves together, we’re working to improve ourselves for each other. Overall, the people behind Habitica have done a great job of gamifying the process of personal growth. This is the longest I’ve ever stayed committed to a habit tracking app, and the game elements are a big part of that success. Another thing that tends to slow me down in my personal quests for self-improvement is figuring out how to design the habit correctly. I’ve written a bit about B.J. Fogg’s take on habit creation (incorporating tiny habits into your day using trigger behaviors that you already perform). I really like his methods and have had success with them, but I feel like Habitica has one-upped him in this because the design incentivizes you to revise the set-up of your habits right away. Within the game you can make any task a Habit (things you do often but aren’t required to do in any specific timeframe), a Daily (things you want yourself to do every day or on specific days or every x days), or a To-Do. These options make it really easy for you to find the right set up for any given task. You might start by making something a Habit and then realize that you actually want to hold yourself accountable to do it on a regular basis. I initially set up going to the gym as a Habit, but eventually made it an “every weekday” Daily. 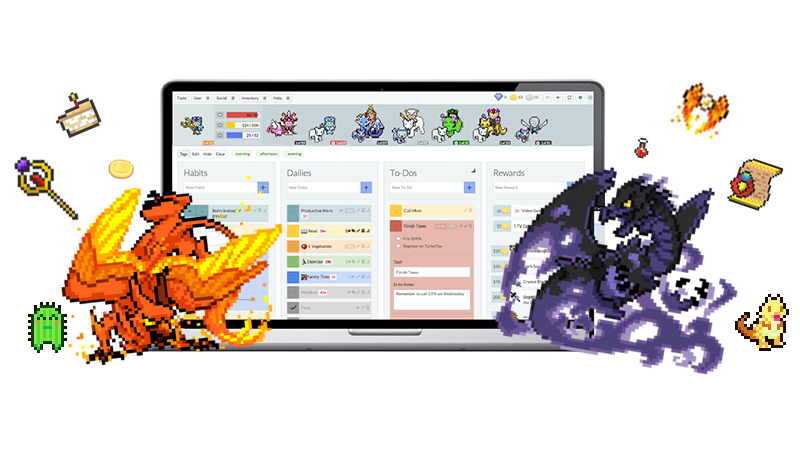 Of course, all tracking apps let you modify your habits, but with Habitica you have an incentive to revise your habit-forming plans as soon as you notice they aren’t fitting your needs: you get points sooner if you figure out the correct set-up right away. Habits are great because you can make them quick, easy things and then reward yourself heavily as you pile up the positive choices. You can set these up as a positive, a negative, or a positive and a negative. I have an incentive to take the stairs instead of the elevator and drink water instead of soda, and a disincentive to make impulse buys. Since setting these Habits up I haven’t taken the elevator once, I haven’t had a single soda, and I haven’t made a single impulse purchase. The benefits of Dailies are pretty obvious when they’re actually daily—you have a disincentive to skip those things you really care about but have a hard time doing. However, a surprising benefit of the Dailies function is that I now remember to do those things that come up once every two weeks, or once every month. The To-Dos feature had a huge impact on me when I got started with Habitica. The game could easily have become something I forgot about and left on the backburner were it not for this feature. Having my workday tasks and my shopping lists in the same interface as my personal development tasks meant that I opened the app on a regular basis. It’s made me better at not just life in general but at my job! If you’re someone who, like me, can’t stick to a hand written to-do list, and hasn’t found the right to-do app yet, this might really help you too. The third thing that tends to trip me up when I’m working to build positive habits is the weight of feeling like I failed. I might accomplish everything perfectly for ten days, miss one day, and fall completely off the wagon. It’s a terrible feeling and in the past it has stopped me from getting a lot of good things done for myself. The design of the health-points system in Habitica cleverly protects you from this particular pitfall. Your health goes down whenever you do one of your negative Habits or fail to do something in the time you allotted for yourself—but one mistake won’t kill you. The next day, you can attack your list with a vengeance and level-up. Every time you do something right your health increases, and every time you level-up, you’re restored to full health. The overall message is one of looking forward instead of back. The game teaches you to forgive yourself for your mistakes and to keep moving forward until you’re feeling like a champ again. If it’s not already obvious, I’m over the moon about this app. If you’re at all like me, it’s a great way to kick-start your personal growth. It’s widely customizable. I have everything from mundane work tasks, to big important projects, to personal care, to emotional health all logged into the same simple interface. Any win in any area of my life buoys me up to do better in another area. Check it out! It might make your year.